Fishing Report March 31, 2012 Jeff Sundin - It should be a busy day at the Northwest Sportshow today. The show opens at 10:00 AM and I'll be in the Lindy Booth all day long. As long as I'm there and as long as I can't come see you, it would sure be nice if you stopped by and paid us a visit. On Friday, I didn't get a lot of free time, but I did get to hook up with a few more exhibitors who had some interesting new offerings. (3/31) From The Northwest Sportshow - On the schedule for Saturday at the show, My friends Jon Thelen and Ted Takasaki are on the show schedule. 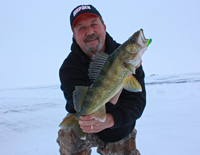 Saturday at 6:00 PM Jon Thelen's seminar, "A Fishing Guides Tactics To Catching More Walleye. Watch for Ted Takasaki who will be doing his seminar "Crankbait Tips For Big Walleye" at 1:00 PM and 4:00 PM. For all of you Gary Loomis fans out there, here's something you'll really like. Temple Fork Outfitters, AKA TFO Rods is building a great line of affordable rods that are designed by Gary from the ground up. He chooses the materials, the guides, the finish, everything right down to the line for wrapping the line guides. The result has been a really nice looking series of quality rods that fall easily within the budget of most anglers. The rods are nicely finished and color coded so that at a glance, you know the action of the rod you're looking at. Today, I'm going to dig a little deeper into the TFO lineup and give you another look tomorrow morning. At the Lund Boats exhibit, Ryan Sproule and Jason Oakes, walked me around the floor to show off some of the new models and features in Lund Boats 2012 lineup. Jason said that they've noticed a trend this season. More families have been coming in to shop for bigger rigs than last year. The word has gotten out that Lund Has Fiberglass and there are more folks checking those out this year too. One boat that fiberglass fans should really see is the 186 Tyee. This boat is the perfect rig for fishing and water recreation. The 186 has plenty of get up aqnd go, a nice smooth ride, it's functional and gorgeous to look at. One of the most popular new additions for this season and a boat that everyone is looking at is the1875 Crossover XS. This rig is perfect for the family who wants to fish, but likes to have a little fun playing the water too. With storage space for Water skis, boards and everything that comes along, families can do some fishing until the afternoon sun warms up the water and then break out the toys for fun in the water. A few more crowd pleasers this season are the 1875 and 1775 Pro V's . The Rebel and the Impact are both getting lots of attention too, especially from families looking at starting the kids off right, with a nice comfortable rig. Ryan Sproule reminded me that these, along with all of the other boats in Lund's lineup are on the floor at the show. Stop in this weekend and pay them a vist. Not visiting the show this weekend? You can still see the whole lineup here at the Lund Boats Website. Finally, I keep running into more cool stuff every day, but I run out of time to write. So listen, why don't you just come on down and pay us all a visit. We'll chat about fishing and the upcoming season, you can take in a couple of fishing seminars and share a smile. To me, that sounds like a nice way to spend the day. (3/30) From Fred's Bait , Bill Powell said that he's been averaging only a half dozen groups per day. Most of them are heading for the Rainy River right now, but soon there will be a contingent of Crappie fishermen checking out the shallow water. The DNR has already set their nets for Walleye Egg harvest at the Cutfoot Sioux hatchery. It's a little early for the fish to start running, but it won't be long and this will go down in the books as the earliest spawning run in recorded history. In the Twin Cities, spring has sprung and the sun was shining here! There were folks talking about plans to head for some of the lakes looking for panfish. Others are headed to the river and some were talking about South Dakota. There's a feeling in the air that its time to get outside and do some fishing. The Northwest Sportshow got a little busier on Day two and after I had some time to settle in, I made the rounds and checked out some more gadgets and gizmos. 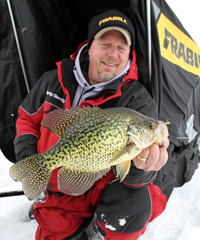 (3/30) From The Northwest Sportshow - If you're the type of angler who takes Crappie fishing seriously, you already know that the time to start checking those back bays and inlets is right now. At the sportshow, I touched base with Tim Price who told me to take a close look at MinnKota's Talon Shallow Water Anchoring System. This neat gadget mounts on the back of your boat and has a telescoping arm that pushes into the bottom to hold your boat solid as a rock in shallow water. The Talon comes in 6 and 8 foot models and attaches as easily as installing a trolling motor. The system is rugged and easily holds almost any fishing boat in position. Just think about how nice that is when you're fishing shallow cover like Bulrushes and tree branches. No more swaying back and forth getting your bait snagged in the cover! Learn more about the Talon Shallow Water Anchoring System. (3/30) From The Northwest Sportshow, Another slick system that I spotted on Thursday was Lakemaster's new Contour Elite Charting Software. I had already seen this software system, but had a cjance to take a closer look. Imagine sitting in your den in the middle of winter while you're studying a lake that you plan to visit next summer. You can view all of the lakes structure in three dimensions, just like the fish sees it. Study the bars, rock piles, points and flats from any angle, up-down-sideways, anything. After you pick out some great looking structure, just mark the spots with GPS coordinates, save them to an SD Card and load into your Humminbird. Next summer, when you get to the lake, you'll fish the spots just like you've fished there a hundred times already. For anyone who gets serious about learning their lake, this setup is the real deal. I already ordered my copy and can hardly wait to start playing with it. Finally, the report is really short today because I've been struggling to keep a decent connection, hopefully tomorrow morning will go smoother and I'll have one last big rport from the show. Next week, we'll get back to fishing! By the way, I really wish I knew a few folks who were interested in catching some big Northern Pike when I get back. It's going to be an unusually good case of timing and I think there are going to be a few really cool spots to visit this spring. With some extra time on our hands, we might even be able to do some Walleye/Pike combos. More about that as we see how the weather influences the early runs toward shallow water. Fishing Report March 29, 2012 Jeff Sundin - The Northwest Sportshow has begun and if it seems like traffic is a little slow out on the lake, it's because most everyone who loves to fish is down here visiting the show. It always takes me a day to get in the grrove. But, once I got my dispaly set up and talked with some friends that stopped by to visit, I had a little time to move around and take my first look at the show. Today is Lindy Day at the Northwest Sportshow! Thursday 3-29-12 Lindy Legendary Fishing Tackle will be at the Northwest Sportshow with a special offer. While supplies last, everyone who enters the show will recieve a Free Lindy Exchange Jig Master Pack. The jigs alone are worth more than a show ticket, so you'll be ahead of the game even before you come and visit me! For all of you animals out there, Billy Rosner's favorite "Big Gun" is the rod that St. Croix calls the "Big Nasty". Here's a Musky rod that's mission in life is to help tame really big baits like double Cowgirls, Bulldogs and all of those giant plastics baits that weigh a ton. Billy showed me his secret weapon for those days when he wants to cast all day long without getting worn out. The "Downsizer" is a seven foot three inch rod that's light and versatile, he can throw almost anything and never gets worn out. When the rest of the crew comes in worn out and sweating, Billy is ready to head back out on the lake to do it all over agin. Rosner showed me something that was right up my alley, the new Panfish Series. I spotted a seven foot, light action rod that says Panfish on it, but has Walleye written all over it! The PFS70LXF looks perfect for my shallow water Walleye fishing. Something tells me that this rod will be perfect on lake Winnie with a 1/16 ounce jig and lip hooked Rainbow Chub! In fact, at only $120, I don't see how I'll make it out of the show without buying one. I caught Tom Neustrom lending a hand at the Daiwa booth and he showed me something that we've needed for a while. A line of high quality, but still affordable Daiwa's! In the past, I've had fantastic results with some of Daiwa's former, mid-priced reels. The problem was that they disappeared for a while. Now, reels ranging from $89.00 to $149.00 give anglers who want something really good, but don't have a million bucks to throw around, something new to look at. When you visit the show, stop in at the Daiwa booth and ask to see the Aird, Exceler and Procyon series reels. Sasquach? You might have thought so at first, but after a little closer look, it turned out to be Mark Braaten from american Alaska's Healing Hearts. For wounded American Vets, AHH provides opportunities to participate in Alaskan Fishing and Hunting Adventures. "Alaska's Healing Hearts year round nationwide outdoor programs include hunting, fishing, and other outdoor recreational programs for our nations brave wounded warriors, these activities are termed "social reintegration" by therapists. They are not just the clinical rehabilitation programs which injured military personnel usually participate in; they also provide disabled Veterans with hope that they can live active and productive lives." On Thursday, come find me in the Grand Rapids-Deer River Toursim booth #737. Friday thru Sunday, I'll be back in black, with my friends working the Lindy Booth. There isn't going to be a lot of news from the lakes, but don't worry! I'll be thinking about you all week long and I'll be reporting news about what's happening at the show and about what's new for the upcoming fishing season. Pictures and interviews from the show floor at the Minneapolis Convention Center. By the way, if you're in the neighborhood, why don't you stop in and say Hey! On Monday, I spent my day in what used to be "My Home Territory" on Lake Minnetonka. We didn't fish, instead we were testing out some gear and taking a few pictures for the archives. The whole time we were there, I was only about 5 miles from Long Lake, which is where we lived when I first started wetting my feet in the guide business. Now that it's been 25 years since I fished the lake, all I can tell you is WOW, I sure do wish that I'd had my Humminbird 998 back in those days! Ol' Uncle Roy's secret spots now showed up like a sore thumb on the Lakemaster Chart! I just might have to make a trip back down there to see if any of those "really big ones" still remember me. We got our work done around 3:00 PM and the drive home was interesting, especially this time because it was in the daylight! Here's what I spotted along the way. (3/27) Ice Report: From Minnetonka heading North to Onamia, every lake I saw was ice free. Lake MilleLacs is in the process of breaking up right now. There were miles of slushy, crushed ice along the Southwestern side (US Hwy 169) side of the lake. By the time I arrived at Garrison, there was a giant bay of open water, with a little bit of slush piled up on the shoreline. (3/27) Ice Report: From Garrison, North on MN Hwy 6, every single lake was either ice-free or soon to be ice-free. (3/27) On Lake Winnie, strong winds on Monday blew gigantic piles of ice onto the East shoreline. Wind has continued to blow strong all night long and I'd guess that Winnie will also be ice-free by the end of this week. (3/27) Open Water Report: From The Rainy River, Matt Mattson said that Walleye fishing over the weekend was generally good. Conditions were cold though and there was a huge drop in traffic from Saturday to Sunday. For Matt's crew, the fish were located in the 22 to 24 foot range in the main river channel near Sportsman's. The river in that area was also packed with Sturgeon and according to Matt, the action for Sturgeon fishermen was non-stop! (3/27) Open Water Report: From The Rainy River, Mike Kinsella at Border View Lodge said; " It’s been a crazy week. We went from ice fishing to open water in just a few days. Lots of walleyes being cau ght this week near the mouth of the river and in Four-mile bay. Quite a few big fish over 28 inches were mixed in with the eaters. The fish look healthy with plenty of males in the 17 to 18 inch range. The sturgeon bite is definitely on. Many monster sturgeon are being caught and released. Cooler weather has moved into the area. Highs and the 40s and lows in the 20s will be the norm. Remember, it’ s still March. It does look like a warm up is coming for next weekend." - Border View has mid-week openings this week. Spring rates are $29 per person per night. For me, A week of working the show should be enough to give me the serious fishing bug, and when my rig rolls back into the driveway on April 1st, I am going to be "Hot to Trot"! Somebody, somewhere is gonna want to go fishing and I'm gonna be ready!! Okay, so in spite of the fact that I won't get to do it myself, this week is going to be a great time to get in on the early run of panfish. They'll make a quick move into the back bays, harbors and creeks. It won't last long, so you need to take the bull by the horns and get out there to do some research. If you do, you'll find a great spot or two and chances are that you'll be the only one there. I really wish I knew a few folks who were interested in catching some big Northern Pike when I get back. It's going to be an unusually good case of timing and I think there are going to be a few really cool spots to visit this spring. With some extra time on our hands, we might even be able to do some Walleye/Pike combos. More about that as we see how the weather influences the early runs toward shallow water. (3-27) Multi-Tasking? Why of course, I AM and always will be ...................... :)))) !!!!!! Personal appearances: I'll be at the Northwest Sport Show in Minneapolis starting Wednesday March 28th, 2012. On Wednesday and Thursday, come find me in the Grand Rapids-Deer River Toursim booth #737. Friday thru Sunday, I'll be back in black, with my friends working the Lindy Booth. (3/25) On The Rainy River, my buddy Matt Mattson, left me a text last night that said they caught 34 Walleyes on the river yesterday. He added that 16 of the fish were over 25 inches and that their largest one was 29-1/2 inches. That reminds me of the scenario we saw two years ago and if it tracks the same this year, there will be a few more days of "the Big Fish Bite" followed by a lull, then followed by a dynamite "action bite for smaller, male fish. Later this morning, I'll get with Matt for some more details and hopefull a few pictures. 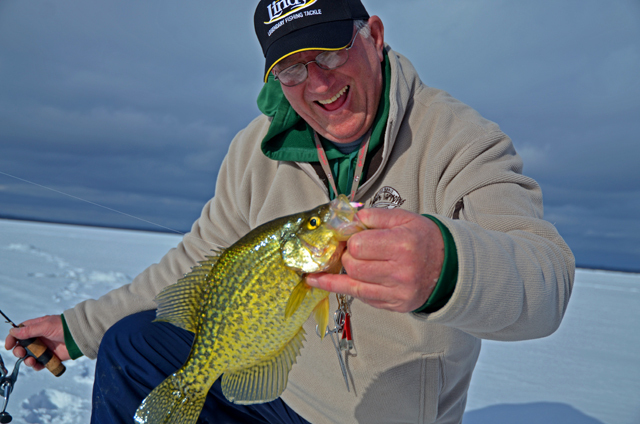 (3/25) On Lake Winnibigoshish, Greg Clusiau had an interesting day on the ice with the folks from Wilcraft. They used the spiffy machines to travel accross open water and crummy ice and found their way to the Perch Hole. There were plenty of cooperative fish when they got there it looks like the machines did a great, safe job of getting the crew there and back. (3/25) On My road trip, I noticed that all of the small lakes along Highway 2 between Dulth and Deer River are wide open. Obviously, so are all of the rivers. On Bass Lake at Cohasset, some of the bays are already open and a there's large swath of open water all along the East side of the Souther lobe of the lake. Just North of there, Deer Lake is still about 95% ice covered, but the ice is black and ready to start breaking up any time. Moose Lake is also ready to break up soon, but remains largly ice covered for the moment. Just outside my back yard in Deer River, Chase Lake was about 60% open already. One windy day and that lake will be wide open! From an earlier report; "Hey! For those of you who really know me, you'd already realize that I would bend over backwards to make something special happen for one of my friends. But, there are a few particular friends, for whom I'd do back-flips, somersaults and maybe even go sky-diving without a parachute! Fishing Report March 26, 2012 Jeff Sundin - Listen, I really wish that I could be in two places at the same time, but I can't. In fact, by the time you read this report, I'm already on the road, heading for the Twin Cities, where we're going to try one more time to wrap up a special video project before the beginning of the Northwest Sportshow. I hit the road at 5:00 AM and with luck, we'll get our work done and I'll be home by early evening. I'll have a few notes about what I find along the path, but for now, here's what I've heard lately. Fishing Report March 25, 2012 Jeff Sundin - I want to say Thank You to everyone at the Douglas County Game and Fish League for all of their hard work. As usual, the Sport Show at Wessman Arena on the U of W Campus was bustling with smiling faces. When you're travelling, there are certain places that you just know that you'll be among friends and for me, this show is one of those special places. For everyone who stopped by to see my seminars and for all of you great folks who mentioned reading this report, this THANK YOU is especially for you! Now listen, I'm not there today, but they do still have one more day to go, so if you're in the area and haven't stopped in yet, make a trip over there today. By the way, be sure you don't eat before you get there because they are serving up some fantastic BBQ Sandwiches. Fishing Report March 24, 2012 Jeff Sundin - For me, it's going to be a week of talking about fishing, but not actually doing a lot of it. For today, I'll be doing the report backwards. This morning, I'm headed for the University of Wisconsin at Superior. I'll be doing two seminars there today and then I'll turn around and head back home to jot down some fishing notes this evening. Tomorrow, I'll catch my breath for a day as I get packed up for Minneapolis to work on a special project and then, I'll be headed for the Northwest Sport Show. Don't worry though! I'll be thinking about you all week long! I'll be reporting news about what's new for the upcoming fishing season from the show floor at the Minneapolis Convention Center. By the way, if you're in the neighborhood, why don't you stop in and say Hey! .... More this evening ..... :)!! Fishing Report March 23, 2012 Jeff Sundin - For the up-coming weekend, most of the folks in my region who want to bend a pole are heading for the Rainy River. There was a little grumbling from some friends yesterday that the river was already getting a little muddy. With such low water levels, I'd think that this was due to traffic, more than water flow. If that's the case, a good strategy might be to fish early and find some of the more "off-beat" areas. I heard from one group on Thursday who had learned the hard way, about using smaller jigs right now. During the first few days of open water, the fish were aggressive and heavy jigs were working fine. If you're in an area where there's lower current flow, scale down to lighter line weights and use 1/4 or even 1/8 ounce jigs. You'll be surprised how many fishermen are using gear that's way heavier than they need. My personal favorite rig for the Rainy is a seven foot, light action rod, 4 pound test line and a 1/4 ounce, Glow-Blue or Glow-Orange jig tipped with a nice size fathead, rainbow or shiner. Okay, so the main focus around here is on the river. But, there are already a few other possible developments that could be interesting too. 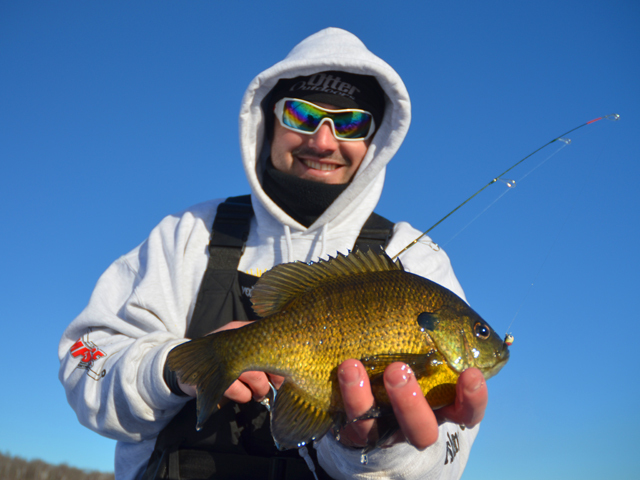 With large sections of the Mississippi River (and other smaller rivers) already wide open, Panfish and Perch will be moning into the isolated pockets of warmer water. 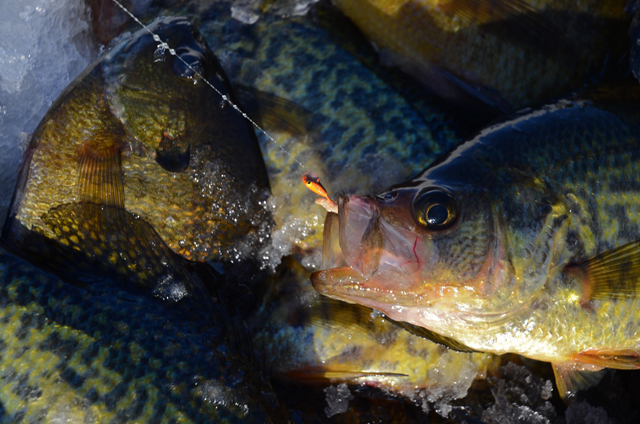 The "hot-pond" at Cohasset has already been producing panfish and there will be Perch action available there any day now. Watch all of your favorite Crappie and Sunfish lakes and the first day you see open bays or creek channels, make your move. 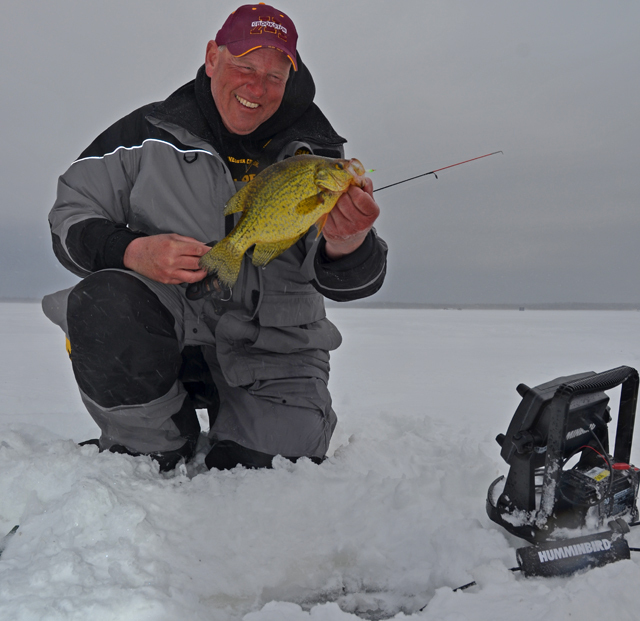 Even when there's ice on the main lake, panfish will make one short move into those shallow bays. Don't worry about getting a boat in just yet, more often than not, you can catch just as many fish by "hoofin' it". By the time the weather clears after this rain, there will be some places ready to go! The first anglers to find the fish are the ones who have all of the fun. If you wait for word that the fish are biting, you will be too late! Sorry, that's just the way it is! (3/23) The West side of Lake Mille Lacs was still mostly ice covered, but the ice is really dark and looks like it could break on the first strong wind. Small, isolated bays and some stretches of shoreline were already open and there were Ducks and Mergansers in every pocket of open water. (3/23) Heading North along US Hwy. 169, every river and small pond adjacent to the highway was open already. Small lakes in the Aitkin area, like Hickory and Little Pine still had ice cover, but it didn't look like they would support any weight, not even foot traffic. By the time I got back to Grand Rapids, The Wendigo Arm of Pokegama Lake had open water from the causeway Eastward, the open stretch ran about 300 yards and the small harbor located on the Northeast corner of the bridge was 2/3 open already. Along US Hwy 2, the stretch of Mississippi River from Grand Rapids to the Pokegama Recreation area was wide open and although it's not all visible from the highway, I'd bet that it's open all the way back to Deer River. Fishing Report March 22, 2012 Jeff Sundin - A nice drive in the country, that's what I did on Wednesday. Our plan to take some pictures down on the Mississppi River went down the drain, literally, when unexpected showers forced the crew to leave their camera cases zipped up. What are ya gonna do? Sometimes the weather just forces things to change. It was a good excuse to look at a few lakes and size up the water conditions on the drive home. Fishing Report March 21, 2012 Jeff Sundin - I'm keeping it short, but sweet this morning because I'm on the road again! It's Wednesday morning at 5:00 AM and I'm headed off to work on a special project. This time we're heading for Red Wing, MN and the Mississippi River where we're hoping for something cool to happen! Anyway, I'll be back on thursday morning, but for now, you can see that the current news is changing over to open water fishing. For most, the Rainy River and The Mississippi River are the center of action. But soon, there will be more open water opportunities as the early ice out reaches into some really interesting, new territories. I wish I knew a few folks who were interested in catching some big Northern Pike, because I think there are going to be a few really cool spots to fish this spring. More about that soon. (3/21) On The Rainy River, Brad Hawthorne, has this report from day 2 of his trip; "we launched out of the Vidas landing at Clementson. The ice was completely gone in just 24 hours. I believe the river is open clear to Baudette. The DNR got the dock in today which also was a plus. Now to the fishing report. Today was a fantastic day of fishing for the team. The wind was light compared to yesterday which made fishing a lot easier. Within minutes of leaving the landing we were hovering over pods of fish on the break picking off 18-19" river fish. We could have easily left with a 3 man limit within our first hour of fishing but we kept the livewell empty so we could pound on the fish all day! The first spot on the break in about 12' of water wasn't producing any large fish, so we moved out to the main river channel into 25' of water. Bang, fish on! Down goes the anchor and we literally sat in that spot the rest of the day eclipsing 100 fish easily. Many fish over 20 with the biggest being a 27" monster. Even a rogue sturgeon made an appearance. Just an all around great day on the water. I sure love jig fishing! All our fish were caught on Lindy Jigs in either glow white, gold, and pink/white. Frozen shiners are the way to go! We picked them up at Log Cabin bait that has a huge supply. I personally wouldn't bother with live bait. Later in the day we upsized to 1 oz jigs with 2-3 minnows and the fish got even more aggressive. Doubles and triples were not uncommon. The fishing is obviously fantastic right now and only will get better as the water temps rise (46 today). Get on up to the Rainy River". (3/21) On Bowstring Lake, a note from Erin at Geiger's Trails End Resort; ; "Bill has been overwhelmed with traffic through the resort. However, there is no more access from our landing! Even though there has been 16 inches of ice, as of 2 days ago, we have open water at our landing. We have lost ice fast and, if the weather keeps it up, it will be gone and the lake will be open soon! Yay, for fishing opener! We have a few cabins still available for opener and the summer season, but they are going fast. Thanks for a GREAT winter season!!! See you this summer! Fishing Report March 20, 2012 Jeff Sundin - That's a wrap? Over the past few days, I've seen a lot of friends hang up their gear for the winter. After daylight on Monday, another day of incredibly warm, windy weather, a line of strong thunderstorms blew into Northern Minnesota. The storms brought in some much needed moistsure; but at the same time, moved us another step toward open water. I was on a road trip into Central Minnesota, where I spotted several lakes that were already wide open, and lots more that are on the verge of opening up. My brother gave me a report from the metro area yesterday and let me know that several of the more popular fishing lakes are open there already too. Moving South from a line starting at Aitkin, virtually every river, small or large was wide open. I guess that even if there are still a few spots where the last of the die hard ice fishermen can sneak out for another trip or two, for the most everyone else, the ice fishing season has run it's course. For me, this is going to be about the fastest transition from one season to another that I can ever recall. Believe it or not, if everything goes according to plan, I'll be working out of my boat starting TOMORROW! (3/20) On The Rainy River, Conditions are good according to Brad Hawthorne, he said; "We had great Walleye action from 7am until we called it quits at 5pm. River curent is low, as is river level, it's unusual for this time of year. Be on the look-out for random ice bergs. All jigging techniques worked today including drift jigging, jig trolling and plain ole anchor and jigging. Gold was definitely the color of choice. No surprise right, lol! End of day walleye count was 73 fish from 15-26, no real hogs but dang fun. 4 "accidental" sturgeon too. We will be out tomorrow and wed, stay tuned for more reports!" (3/20) On The Rainy River, Conditions are changing hour by hour, but if you want to fish open water, there are landings open right now. As of Monday, there were anglers already using the Birchadale and Frontier landings, Vidas was still ice bound, but will be open in a few days. By this weekend, anyone who want to fish the river, will be able to do it. (3/20) On The Rainy River, Mike Kinsella, Border View Lodge posted his report; "Wow, things happen quickly. Last week we were talking about ice fishing. Now we’re already rolling into spring fishing. Record temperatures last week have the river open just east of Clementson. With warm temperatures expected to continue, there is a good chance the river could be open to the mouth by the end of the week. I talked to a couple groups yesterday. They said fishing was good and the walleyes were cooperating. There was still some i ce at the landings, but I would expect that to be cleared later this week. The last day of spring walleye fishing is April 15th. The catch and release of sturgeon is year round, and the spring “keep” season is April 24th through May 7th. Don’t miss out on some great spring fishing. Cabin rates are just $29 per person per day. Our bar and restaurant will be open." Fishing Report March 19, 2012 Jeff Sundin - It felt even more like summer on Sunday as the sun made an appearance. It might have been the last weekend of ice fishing for many, in fact it probably even was for me. But anglers found travel conditions to be good this weekend and most of them found the fishing action pretty good too. After a long day on the ice Saturday, I had to stay home and crack the whip a little bit on Sunday. The only day to finish up lots of chores before the summer sets in and the work crew disappears, forever! By days end, most were done including the unveiling of a particularly familiar Red and Silver piece of equipment that had been hiding in the barn all winter long. (3/19) On The Rainy River, Vern Valliant texted me a photo of his step-sons first Sturgeon, a 48 incher caught on the Rainy River last Saturday. River water is opening more each day and according to Bill Powell at Freds Bait, there are already a flow of boats heading that way. Before you start driving, check for details about the detour on Hwy 11 between Baudette and Frontier Landing. The fishing highlights on Lake Winnie from the weekend, all sounded really good. Perch anglers all over the lake were reporting lots of action and for ATV travel, the ice was holding up really well too. 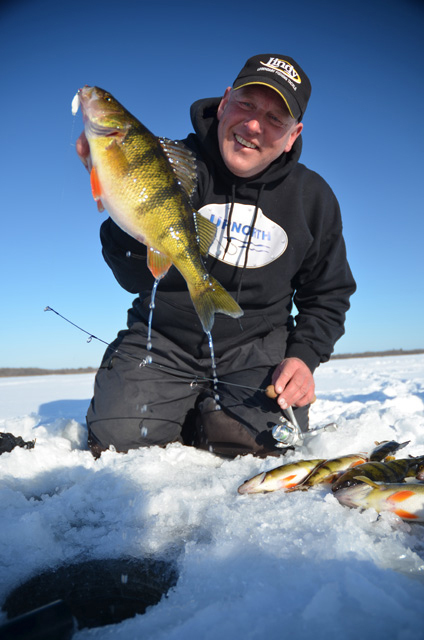 (3/19) On Lake Winnie, Steve Picht said; "Saturday was a great day of Perch fishing on Big Winnie in the 3 Sisters area of Tamarack Bay! We went thru approx 100 fish today in 4 hours. Kept a nice bunch of 9"-11 1/2"er's. The ice conditions were deteriorating thru the day. I could feel it changing as the day went on and could hear the water draining thru the ice. Pretty cool! The access is starting to get difficult. Shoreline ice is weakening fast. A few 4-wheelers went thru friday by Tamarack Lodge and you could see where they were starting to have trouble at the old landing north of Plughat. Getting close to the end now! Be safe!" (3/19) On Lake Winnie, Bill Powell from Fred's Bait posted this; "We fished Winnie for a few hours on Saturday. Ice conditions surprised me, they were still very good with no problems getting out. There were lots of fishermen out there and most headed in around 3 pm. with there limits of fish. (3/19) On Rainy Lake, meanwhile just down the road a piece, Chad Brandt was ice fishing on Rainy Lake and wrapped up his ice season with a really nice looking 25 pound Northern Pike. Fishing Report March 18, 2012 Jeff Sundin - Saturday's record setting warm temperatures aren't going to encourage the ice stick around, but can you still get on the ice to fish this weekend? Sure, no problem! Just don't get too carried away with your travel plans. It took a little doing, but after hammering things into a rough form of organization, I was able to get some of our guests out of the house and on to what's left of the ice. When we arrived at the (first) lake, any sign of the snow was completely gone. There was a small patch of sand and a little open water at the ramp, but it was easy to steer around with the ATV. The ice surface was strange, after all of the standing water drained, it left the surface full of scalloped dips and divits. It was really interesting to look at, but a little tricky to walk on. I'd forgotten to bring cleats and I was sure that sooner or later I'd take a tumble, but somehow managed to avoid doing that. If you're heading out today though, be sure that you have yours with you! We never had to drill a single hole at lake one. There had been enough people fishing there during the past week to have holes drilled almost anywhere we were interested in fishing. Obviously, if any holes have been drilled recently, they are still open wide open. Thanks to all of the draining water, some of them have grown quite large too, there were several of them large enough to slip a large boot into, so be sure to watch your step! Fishing on the little lake started off pretty good, in fact it looked like we were going to have a lot of action. About the time we had a dozen fish on the ice, someone flipped the switch and the biters turned into lookers. By now it was mid-day and we had to decide whether to tough it out and hope for an evening bite, or if we should change lakes. We stewed on the idea for a while, but after another half hour, we were frustrated with looking at fish on the sonar that wouldn't bite and decided to jump to a different lake. At lake number 2, the conditions were just like the first one, un-even, but dry surface, slippery and really humid. Unlike lake 1, there weren't a million holes to try, so this time we (Matt) had to do a little drilling. There was still about 18 inches of good, but getting wet and honeycombed ice. We poked around in water depths of 20 to 30 feet and most of the time, spotted only single fish or at most 3 to 4 fish in small, roaming packs. I picked up a nice Jumbo Perch and then lost a nice Crappie at the hole. Austin Picked up one giant Bluegill and Matt was specializing in baby Northern Pike. It felt like there was potential, but so far the plan wasn't quite coming together. Moving from hole to hole, I evenutally stumbled into one that had a nice school of fish under it. In fact it was the second prettiest sight I'd seen all week long! In 29 feet of water, just off the outside edge of a small bar, the Humminbird was lit up with a school of fish. I dropped in a glow-blue Frostee Spoon tipped with 3 or 4 Eurolarvae and as I watched the bait falling on the sreen, I could see a fish rising to greet it. Oh Boy, You know what that means! The first one was a nice Crappie, so was the second one, then a Bluegill and then out came the camera. We didn't want to risk spooking this school of fish, so we didn't drill any new holes. By the time we were finished, we had caught almost all of our fish by just taking turns dropping our baits into this single hole. That's the way ice fishing is sometimes, if you just keep moving, sooner or later the right spot comes along. A variety of baits worked, but we had good action on the old standby, glow-lime Frostees. The glow-blue Frostee Spoon, Bug and Toads worked too. Everything was tipped with either Waxies or Spikes. For today, things are a little hectic around here and I'm not sure if we'll make it out again or not, but I'll continue to have ice updates as long as there are still anglers fishing. I still have some more to add to this report too, but for now, I'm up against the clock, so I'll have to catch back up again later. Fishing Report March 17, 2012 Jeff Sundin - One more weekend? Sure, no problem! Just don't get too carried away with your travel plans. For Saturday, the news hasn't changed a lot. Thanks to dry conditions, moisture on the ice is almost entirely gone. Since the melting has stabilized somewhat, there's still enough ice in most places to pull off your fishing trip for this weekend. That said, there are already a lot of anglers in the Itasca Area that have put away their jiggin poles and started shopping for a new boat. Today, my daughter comes home from college for a visit and I think we'll be heading out on to the lake for one last try. Even if we're not fishing, we'll be checking on conditions and snapping some pictures. We'll have some updates by the end of the day today. (3/17) I don't have a ton of information about the Rainy River, but so far, what I do know (as of Friday) is that neither Frontier nor Birchdale landings are open so far. There have been some anglers fishing downstream from International Falls though and while their Walleye fishing hasn't been gangbusters, they are catching some "eater size" Walleyes. On Thursday, we made a late afternoon re-run to Bowstring and had a pleasant surprise when we found that almost all of the water that had been standing on the ice, had now drained through. The surface was dry, slightly honey-combed and very easy to walk on. There was absolutely no need for an auger because every hole that's been drilled by anyone for the past week is still wide open. Watch out for some of the big ones though, they've been enlarged by running water and if you got caught off guard, it wouldn't be too hard to slip a boot into one of them. The landing was in better shape than we expected, so just this one last time, we opted to drive the truck out onto the ice. It was still solid, but now measured only 19 inches thick. By the end of the evening, I had convinced myself that I like the idea of hoofing it into some smaller lakes from here on out. You might remember me mentioning on Tuesday that I'd had a lot of trouble with my gear that day. Well, I finally managed to get all of that gear working. Just in time to find out that the Crappies had made a move. We tried to finesse what was left of the small, splintered packs of fish into biting, but we were a day late and a dollar short. A few small Crappies were all that remained of the active fish on the two areas where we'd been working. In spite of my temptation to switch back to being a Perch fisherman, I'm going to hang tough, re-group and try to find another good Crappie hole somewhere else so that I can get a few photos for some work I still need to wrap up before ice-out. Fishing Report March 15, 2012 Jeff Sundin - Okay, stop the presses! If you're on your way up for an ice fishing trip this weekend, plan right now to use ATV's. The sun is out and it's bearing down on the ice with full force. There's a good chance, that this will be the last weekend for ice fisherman in Northland for the rest of this season. I didn't get out on the ice on Wednesday because I spent my day fixing broken stuff! But I did spend a lot of time checking in with my fishing buddies and a lot of them have already pulled the plug on any remaining trips for the weekend. (3/15) On Cass Lake, Chad Benson said that he's pulled his rentals off of the ice and cancelled a couple of trips that were scheduled for the weekend. Chad said that with all of the problems with ice conditions that anglers have faced this winter, he just didn't want to risk anyone getting in trouble out there. He thought that anglers who want to fish the shoreline, could probably still get away with it for a few more days. But don't head out unless you've done a little homework first. (3/15) On Lake of the Woods, Jacki LaValla from Sportsman's Lodges had this report; "As of 3/14/2012 we are done ice fishing for the year. Adrian's and Morris Point's ice roads are open to ATV's however we advise anyone looking to go out to call them ahead of time for the most up to date information as this is changing daily. The Rainy River is open between Indus and Birchdale and it is anticipated that it will be open to Birchdale by next week sometime." "Walleye season remains open on the Rainy River and Lake of the Woods until April 15. Northern Pike never closes and sturgeon season is open for catch and release through April 23, keep 1 April 24-May 7, catch and release again May 8-15." Jacki mentioned that there are still lots of spring fishing opportunities ahead and suggested that you "snag a good deal with their group spring rates". $39 per person per night. (rate based on double occupancy and plus tax) 800-862-8602. (3/15) On The Rainy River, There's open water in the main river channel already and there are some folks talking about small boats on the river by this weekend. The ramps at Birchdale and Frontier are not open yet, but check in every day for updates. Anglers can use this quick link to check on the seasons and regulations for Rainy River springtime fishing. Click here for Rainy River Spring Regulatuions. (3/15) On Lake Winnie, Karen at Dixon Lake Resort reported that the access road, #2794 to the Third River Landing will be closed at the end of the day, today 3-15-2012. The bad roads to the ice are the problem, she added that the ice on the lake is still good. But added, "just watch for the bad spots. Lot of water out on the ice." Fishing sounds like it is still good here and there. Karen did have some guys out on round that got into the jumbo perch and then managed a trip out on to Cutfoot for the Sunnies. 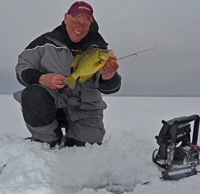 (3/15) In the Bemidji Area , Paul A. Nelson, Bemidji Area Lakes Guide Service says; "To use a sports analogy, the ice fishing season should be considered “day to day” or maybe even “hour to hour”. Unseasonably warm temperatures this week quickly melted most of the snow on the lakes and will likely put an early end to the ice fishing season. Anglers were still driving vehicles on the lakes earlier this week, but deteriorating ice conditions will soon force anglers to use ATV’s or walk onto the lakes. The ice usually breaks-up along the shoreline first, so the problem for anglers is finding a safe way to get on the lakes. Even if anglers are able to get on the ice in the mornings, there is no guarantee they will still be able to get off the ice safely at the end of the day. All of the accesses on all of the lakes won’t break-up at the same rate. Some accesses may be shaded and have less traffic, so they won’t break up as fast as heavily used accesses in full sunlight. Generally speaking, accesses on the east and south side of the lakes break-up slower than accesses on the north and west side of lakes because of the angle of the sun. Anglers north of an east-west line created by highways 34, 200 and 2 have until March 19, 2012 to get their fish houses off the lakes, but the warm temperatures have created unsafe ice in many areas, so anglers should get their houses off the lakes as soon as possible. Fishing Report March 15, 2012 - Brian "Bro" Brosdahl Said that he'd been out on the lakes all day on Wednesday and that he's never see the ice go out this fast before. His first words for anglers planning to fish this weekend are "Don't drive your truck on the ice, even if you see other trucks out there"! Bro is recommending ATV's only because even though there is still good ice, sand, mud and road salt are ruining the accesses really fast. There's nothing worse than getting trapped out on the ice without a way back off of it. Pay attention to the weather Thurs-Sat, it will be in the 60's and even 70's on Saturday with rain! Check here or call your local resorts and bait shops to find out what condition their shoreline acess points are in. Now the good news; Even if you're hoofin' it, you'll be able to squeeze in one more good trip. Sunfish, Crappies and Perch are all making migrations toward shallower water weedlines. Bro Said; "Lakes such as Bowstring, Cutfoot, Winnie, Leech and Cass Lake; Perch & Panfish have gone shallow in the weeds, 10 feet deep or less." "Northland's Bro Bug in the Lady Bug or Tiger Beetle color, tipped w/ Maggots, Wax Worm or Minnow Head. Also try a Macho Minnow, Buckshot or Forage Fry , Day Glo Perch( color )Gold. On cloudy days Goldfish or Red Glo Chub". Bro wrapped up by saying "Thanks Eveyone for a wonderful ice season, be cautious if you decide to venture on the ice this weekend". Bro is now taking bookings for the open water season. For more information click >> Bro's Guide Service. 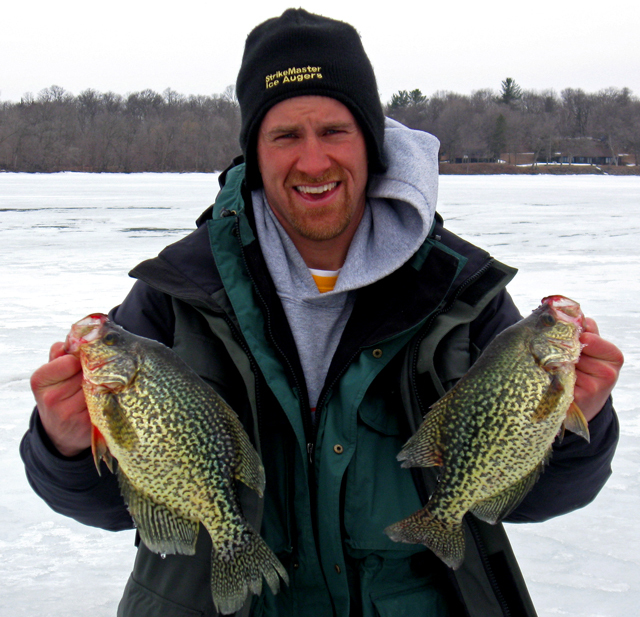 Fishing Report March 14, 2012 Jeff Sundin - Spring weather is zooming in on Northern Minnesota and according to the birds and the ... well okay, maybe just the birds, we're going to have an early ice-out this year. On Tuesday, high blue skies and tempertures in the mid to upper 50's took another big bite out of the ice and snow. It seemed like the perfect opportunity to take care of an important project that the warm weather has suddenly turned into a "Rush Job". I started out my day with lofty goals, first, making a phone call to line up some help from my high priced, executive assistant. Next, I spent all morning scurrying around, gathering assorted pieces of fishing gear and making ready for all of the work that I'd need to get done in the afternoon. By Noon, I was ready to go and headed toward Bowstring, Minnesota where I picked up Arne Danielson. 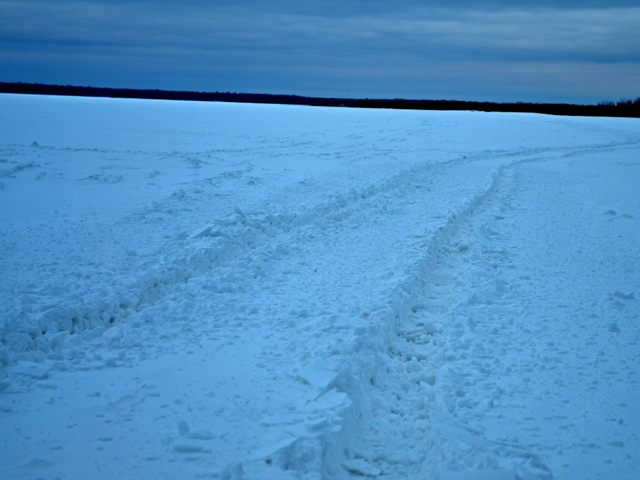 We made our way to the lake, where I was thrilled to see that we could still get out onto the ice with my pickup. The landing was okay, but the snow and ice are melting pretty fast. Combined with some mud from the road, the first 30 feet of ice was turning into that mixture of slushy soup that eventually makes access impossible. Once we were on the lake, the ice wasn't bad, still solid and still a couple of feet thick. There was 2 to 3 inches of water standing in most areas, a little more in some spots, less in others. We headed for what we hoped would be a good Crappie spot, stopped the truck and Arne started drilling. Soon, we figured out that if we drilled holes in areas where there was standing water, it would drain into the holes just like a flushing toilet. Not too much fun to fish, so we started looking for high spots on the ice. 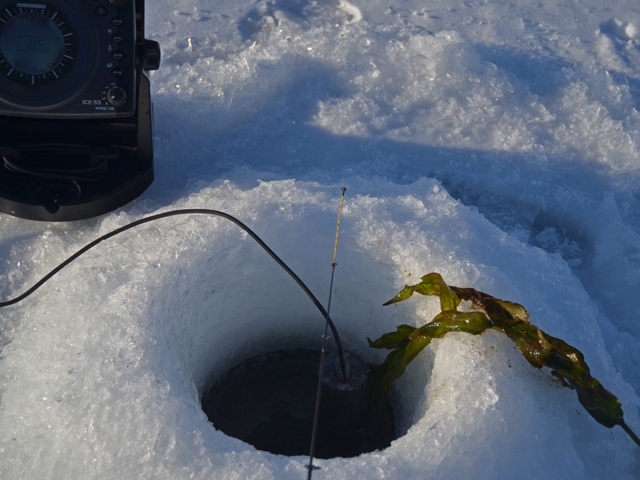 Any place where there was some hard packed snow or a lump in the ice was still easily fishable. At the first stop, we saw some fish but they were all lookers, not biters. At the second stop, we were luckier, here there were no lookers at all, so it was easy to make the decision to move. At stop 3, Arne found one hole that seemed to have a little school of fish moving in and out and it wasn't too long before he'd picked up a keeper Crappie and few smaller ones that he released. While he was doing that, I was struggling to get any one piece of equipment working. I was having one of those days where everything I needed was either missing, broken or just worn out. Dead batteries, splintered cords, dull blades, missing tools, the whole shabang! Finally, I found enough stuff to peice together a workable flasher and started checking more holes in the area. This was going to be one of those days, no matter where I looked, every other hole, there might be one or two lookers, but they just weren't going to hit. We've all seen this before, one hole has the magic and everthing else seems to be getting snubbed by the fish. That's how it worked out this time. By the end of the day, Arne had picked up around a dozen Crappies, I think five of them were good keepers and the rest smaller, released fish. There were a few Perch thrown in the mix too, so at least there is a nice fish fry on the agenda. Listen, this is a good tip for Bowstring Lake! The water where Arne caught his fish was 24 feet deep, over a soft bottom hole, adjacent to a larger flat. The flat tops off at about 18 feet but the fish were located only in the corner where the deep water met the Northern edge of the flat. It didn't matter if we went deeper, out into the middle of the hole or shallower up onto the top of the flat. There were no significant numbers of fish located anywhere but on the corner. Bowstring Crappies have a habbit of doing stuff like this and if you watch your map for these little dips and then get located on the transition from deep to shallow whater, you are going to eventually find some fish. For Arne, the best bait was a larger than average, glow-lime Demon tipped with a tail hooked minnow. When he spotted a fish on his flasher, he jigged aggressively to get their attention and then let the jig settle about a foot over their heads. For Today, I'm going to stay home and try to get everything patched back together. If I make it through without breaking anything else and do get everything pieced back together, then I'll set the alarm for Thurssday and one last attempt to finish up my project before the ice is gone. (3/14) On Lake Winnie, John Seekon from The Pines Resort posted; "The ice on the lake is now drying out after the big snow melt of the weekend. From here on out we are recommending 4 wheeler traffic only, as the landings are getting soft with the warm temps. The perch are being found in 6 to 11 feet as they are starting the move towards there spawning areas." The Pines Resort will be closing on March 19, 2012 until the Walleye opener in May. 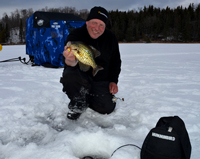 (3/14) On Ball Club Lake, Gus Sheker from Gus' Place Resort; "Warm Spring weather feels good to us all, but it signals the beginning of the end to Ice fishing season. 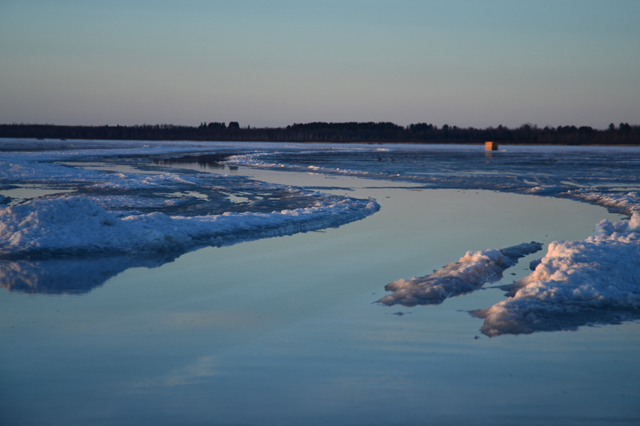 Late season ice fishermen can expect large areas of slush & water on the ice especially in the afternoons. The lake edge is expected to hold this week but start to give a little by weeks end." About the FISHING, Gus Added that "the trends have not changed for several weeks here on our lake, they remain very good for some species, check previous report for details." 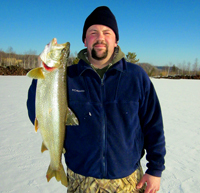 (3/14) On Bowstring Lake, Darv Oelke, Bowstring Shores Resort said; "The fishing is picking up. Every one is catching both perch and crappies. 18 to 22 feet of water. So far today they are still driving pickups off my landing and the west side by northern acres. I don't know about thesouth one. Now with no snow on the ice that one is maybe workable also. I would guess the next few days with warm weather it will be ATV's only with a bridge out to the good ice." (3/14) On Lake Winnie, Ryan Peterson; "The ice on Big Winnie is holding up for the moment and getting out right now is day to day, atvs are the best form of travel, check with the resort you plan on going out of because things are changing fast. The perch bite remains strong in 14 to 18 fow through out the lake, allot of people still fishing the Ravens area and also along the break line on the south end. Last thing, I would like to say thanks to all the folks who came to Winnie and the Lake Winnie area this year for some fishing, from here I have one more trip today and then its off to get the boat ready." (3/14) On Pokegama Lake, Brian Castellano has been out on Pokegama the last 2 days. He's been catching in his words; "TONS of perch w ith some 'Gills, Crappies, and Largemouth Bass in the mix." The summer edition of the UPNORTH fishing paper is hot off the press and ready to hit the news stands. Get a jump on your fishing buddies and read it right now! Click here to Read UPNORTH 2012 Summer Fishing Edition. Oh and by the way .... page 3 seems especially interesting to me, what do you think? (3/12) On Lake of the Woods, Mike Kinsella from Border View Lodge said that the past week was the toughest of the winter in terms of catching numbers of fish. Mike says that their guests really had to work for their fish. It wasn't all bad, there were some larger Walleyes caught and there have been some nice Pike coming in as well. Lots of fish are being marked, some suspended. Some anglers are having better luck jigging aggressively with jigging spoons, stop signs, and charmers. Mike said; "As of now, we still have 30 inches of solid ice on the lake and over two feet of ice on four mile bay." They'll be monitoring ice and river conditions as the warm weather works its magic. (3/12) On Leech Lake, Jason Green, from UPNORTH checked in with this report; "For the past couple of days I was lucky enough to share the ice with some of the best ice anglers in the Upper Midwest. 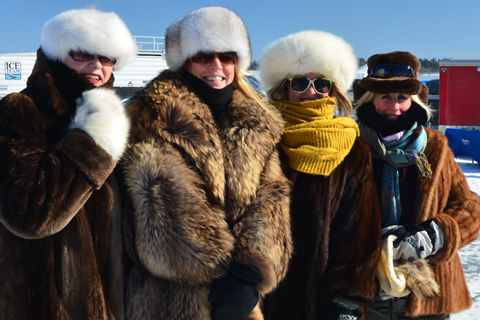 The 2012 Ice Shots was based at Chase On The Lake (in conjunction with Clam, Vexilar & Leisure Outdoor Adventures) on beautiful Leech Lake. Chase, located in downtown Walker, MN definitely has their act together providing five star accommodations, service with a smile, excellent food and a breath taking view. Now that the MN Walleye Season is closed to inland waters, Pan Fish were on the menu. However we did manage to catch several Bass, Walleye and even a Musky. With Leech being such a huge body of water the guys from Leisure Outdoor Adventures had to put in their time along with Dave Genz/Jason Mitchell and their crews before the group showed up. Weather was perfect for our outing in Northern MN! When we left early the first morning snowmobiles were a must but by days end a good portion of our snow had melted allowing for “some” truck traffic. Genz and his crew took us straight to a mid lake flat where the average depth was 6’-7’ of water with some vegetation and said, “Here is the spot, start drilling.” Many of us enjoyed constant Gill action throughout the day. For me, Northland’s Gill Getter and Mud Bugs worked best tipped with waxies. Holding our baits 2’ off the bottom and just letting the caffeine shakes do most of the work seemed to be the ticket. We have been lucky enough to enjoy steady Pan Fish action this year but the best is still to come. Fishing Report March 13, 2012 Jeff Sundin A rain soaked Monday kept most anglers inside and encouraged even more snow and ice to leave the area. My guess is that after today, we're going to see a dramatic, short-term improvement in the ice conditions. Standing water from the melted snow and rain will disappear, the surface will get dry and then, until the landings get too soft, we'll be able to go anywhere and do anything for a little while. Maybe a week, maybe more if it gets cold again. I'd suggest including your ATV and a set of cleats for your boots in all of your fishing plans from here on out. Today, we'll be gathering the mid-week updates and on Wednesday, we'll have a good idea about the condition of the major access points. Fishing Report March 12, 2012 Jeff Sundin Meltdown! This was the kind of weekend Perch fishermen wait all year for. The quintessential March meltdown, complete with sunshine, warm temperatures and six inches of water on top of the ice. Thanks to the change back to daylight saving time, I had plenty of time after wrapping up a weekend at the Grand Rapids Boat Show to take a tour of the area and check out some of the ice conditions. It was a lot like you'd expect. Most of the snow has already melted and anywhere that there was a plowed road, the water is the deepest. For now, the ice sheet is still in good condition, but the weather that's heading our way is gonna make this process go fast! In fact, I'm not too sure that we'll be able to drive vehicles for much more than another day or two. On a road trip to the Twin Cities area, my daughter spotted Lake Waconia and told me that as of yesterday, it was already ice-free. She said that there were other lakes open too and that as they moved North, every lake she saw was covered with lots of water. I stopped and looked at the landing on the South end of Ball Club Lake. If I'd wanted to drive onto the ice, I could have done it. But the edges are already soft and muddy, so from here on, every vehicles that goes out will make it a little worse. In a day or two, the landing won't be useable for vehicles. Same thing goes for snowmobiles, you can start leaving them at home too, there just isn't any more snow cover. ATV's will be the way to go for most anglers, but for me, I kind of like the idea of hoofing it back into some of the smaller lakes like we did during early winter. Maybe we'll get in on a couple of last minute Crappie bites before we turn our attention to open water. Fishing Report March 11, 2012 Jeff Sundin Saturday was like summer in the Grand Rapids area. If I had to be stuck inside, at least I was walking around on a show floor, full of new Lund Boats! One more day at the boat show today and then, I'll be heading back outside to do some sniffing around myself again. In Grand Rapids, this is the my last appearance of the season. So if you've been holding off on asking questions about Lund Boats, Mercury Outboards, Humminbird, Minnkota .... or just want to chat about the up-coming fishing season. Today is your last chance to stop in and say hello! Click here for more information about >> Ray's Sport & Marine at the Grand Rapids Boat Show. 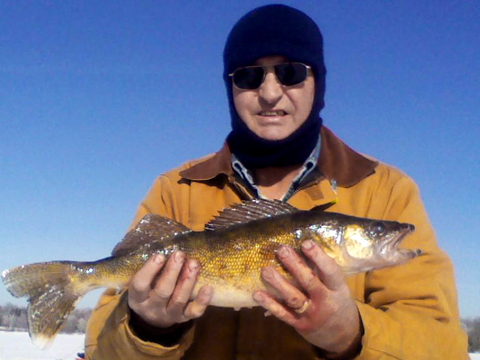 (3/11) In Deer River, Bill Powell at Fred's Bait Shop in Deer River; commented: "The phone is ringing like crazy from guys wondering about ice conditions on Winnie. As of Right now we got around 30 inches of ice and conditions are great It didnt get above freezen hear yesterday 12 this morning not sappose to get above freezen today and cold tonight around 0 I think. So should be a good to go for weekend might want to have a little sunscreen." Feature Fishing Report March 11, 2012 Greg Clusiau My favorite walleye rods are cleaned up, re-spooled, and stowed securely away in an Otter rod case. These things are tough as nails and I use it every time I am hauling gear in my fishing shelter, an Otter “Cottage”, which will be pulled several miles on the big lake. The rod >> .... Click here to read Greg's Iron Range Fishing Report. Fishing Report March 10, 2012 Jeff Sundin I rolled back in from Lake of the Woods last night and looking backward, I guess we should have been planning our trip for this weekend. After a blizzard nearly blew us off the lake on Thursday, a cold front settled over tha lake, leaving us with morning temps of -6 degrees on Friday. The fish weren't exactly standing in line to take our baits, but there were some moments of greatness. A few Northern Pike in the 20 pound range helped us focus on the mission and without a doubt, I'll be planning to make another visit. With weather forecasters predicting 50 degree temperatures and calm winds today and tomorrow, there's no doubt that it will be a busy weekend around here. I'll be catching up on the reports throughout the weekend, but first, I need to take care of a couple of work days at The Grand Rapids Civic Center for the Grand Rapids Boat Show. There will be several fishing seminars today, including one by me at 1:00 PM. So if you're in the neighborhood, stop in and say hello! click here for more information about >> Ray's Sport & Marine at the Grand Rapids Boat Show. Fishing Report March 7, 2012 Jeff Sundin On Tuesday, warm temperatures got rid of a little snow, but that's both good and bad. At least for the next few days, slush problems are going to crop up in all of the usual places. Any place where there's been a lot of ice fishing traffic, at or near creek mouths or other spots of open water and obviously, close to the landings at shore. Right now, the ice is still really good. There's at least 20 inches (or more) of good clear ice almost everywhere North of US Hwy 2. If the warm weather predicted for the weekend arrives on cue, expect a brief period of greatly improved ice conditions, followed by an earlier than usual ice out. We'll be following the ice conditions right up until the end, so keep checking in every morning. As I mentioned yesterday, clearing the papers from my desk and preparing for the trip to Lake of the woods has kept me inside for a few days, so I'll keep today's report low key and let the pros who have been out on the lake do the talking for me. But before I do, heads up for a few quick reminders. (3/7) On Bowstring Lake, Erin at Geiger's Trails End Resort; "We have anywhere from 12-18 inches of snow on the lake. Trucks have been passing through ok. Snowmobiles and 4 wheelers are best mode of transportation. We are expecting a warm up this week which means a lot of slush coming soon. Be careful out there." "We do have a plowed road out. It goes about a mile or so" at the end of the road, anglers are working their way around the lake and it has been manageable. Erin added; "We've had guests come through and were able to get out to the crappie drop off yesterday with no problem". "As for the North end, we have a suedo road out towards the Wind Mill and we are trying to keep it open" "Bill is working hard at getting people to were they want to go. If you do happen to get stuck out there, give us a call." We will be running our ice fishing contest during March and remember, if it's LEGAL to posess, then it counts! Neil and Shannon found a little honey hole for Crappies, so at the moment, they have a 12 1/4 inch Crappie in the lead. Come by the resort and register your catch. Fishing on Bowstring Lake is mixed right now. 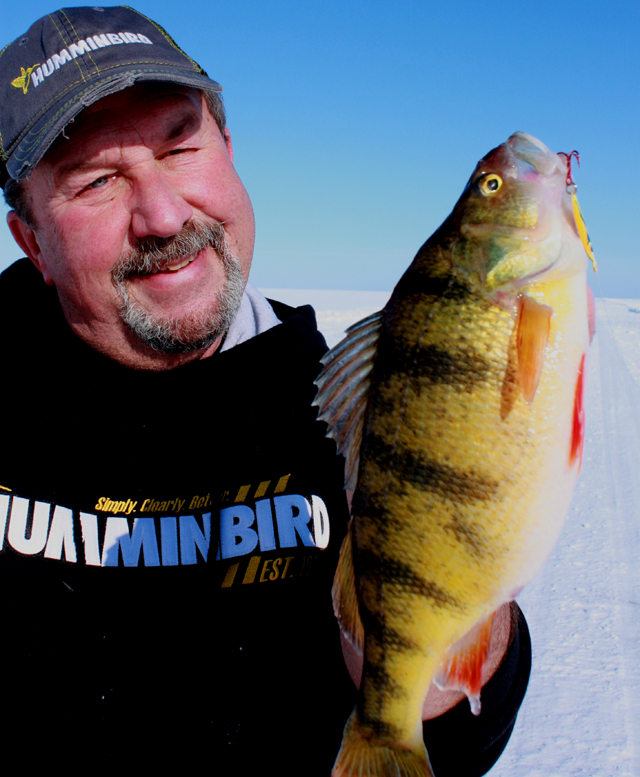 Most anglers have lost track of where the Perch migration has taken them. At the moment, Erin said "Perch are scarce" and added;" I think they have moved toward their spawning grounds or maybe the storms that came through made them finicky. The good news is that Crappie are still hitting hard on the deep drop offs. Under new ownership, Bill and Erin now have winter cabins available for overnight stays or Winter Get-a-Ways. Learn More >> Geiger's Trails End Resort. 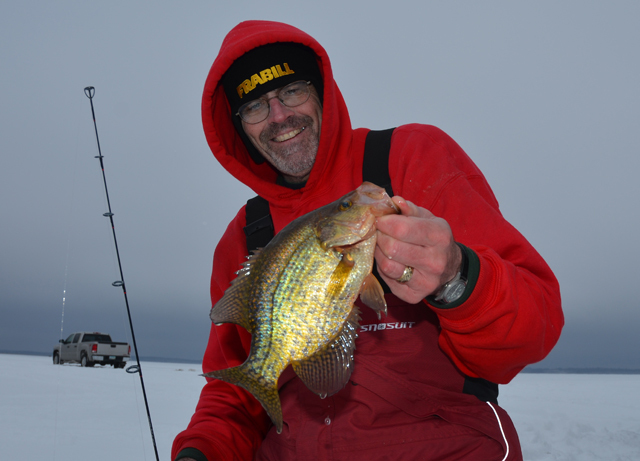 (3/6) On Bowstring Lake, Darv Oelke at Bowstring Shores Resort said; "Fishing has been a little slow, but they have been catching some decent crappies in the 24-28 feet range. They're getting a few perch a little shallower too. We'll see when the guys come in today with the nicer weather what that does to the fishing. We have seen some 4 wheel drive pickups driving on the lake but mostly ATV's or snowmobiles. 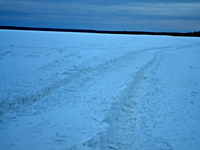 (3-7) Bemidji Lakes Area, Paul A. Nelson, Bemidji Area Lakes Guide Service says; There is still a significant amount of snow on the lakes in the Bemidji area. The amount of fishing pressure is way down on most lakes because anglers can no longer drive vehicles wherever they want on the lakes without getting stuck. 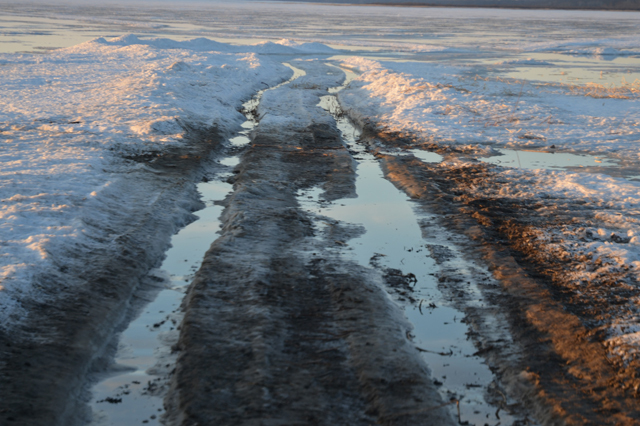 Most anglers are only driving vehicles on plowed roads or established trails on the lakes. Anglers wanting access to more remote locations on the lakes are using snowmobiles or track vehicles. The snow is beginning to melt again on the lakes with a warming trend across Minnesota. 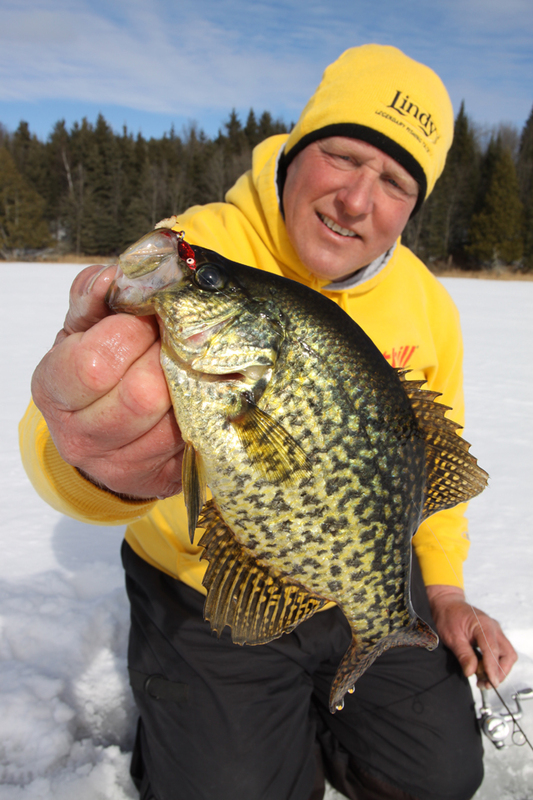 The amount of time left in the ice fishing season will be determines by how fast the snow melts on the lakes. Fishing slowed down during the snow and colder temperatures, but a full moon and the return to warmer temperatures this week should improve the bite for most species. 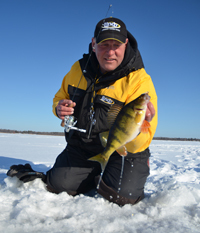 Perch have been biting best in deeper water in most lakes, but the perch will be moving towards the shallows on late ice. Schools of perch will move on top of large flats and humps to feed on crayfish, minnows and insects hiding in the chara (sand grass), rocks or other broken weeds. Crappies have been suspended between 3 and 8 feet off the bottom in most lakes, usually on the edges of deep water in 25-35 feet of water. Anglers should use their electronics to help them locate the fish. Scented plastics like Northland’s Impulse baits on a small jig have been the hot bait, with other anglers using a jig and minnow under a bobber for crappies. Eelpout are starting to spawn on top of humps and other mid-lake structure with direct access to deep water. Eelpout spawn in large communal groups, with the best bite usually during low light or after dark. Feature Fishing Report March 7, 2012 Greg Clusiau It was on that windy, twisty, hilly, and bumpy highway 38, north of Grand Rapids. Somewhere near the North Star Lake area, we were coming back from a fishing trip, when we hit a frost heave. It caught us by surprise and we were .... Click here to read Greg's Iron Range Fishing Report. Fishing Report March 6, 2012 Jeff Sundin After a short break on Sunday afternoon, Monday's weather was a return to the Grey skies and breezy conditions. Since our last snowfall, there's been a noticeable decline in fishing traffic and fishing chatter. I've used the run of crummy weather as an excuse to clear a log jam of papers and website work from my desk so that I can be ready for one more barrage of special fishing projects. Beginning tomorrow, I'll be travelling up to Lake of the Woods for a special late season Walleye project. As soon as I get home from LOW, I'll spend the weekend with the boys from Ray's Marine at their boat show and then I'm ready to turn right around and head back up to Lake of the woods. As always, my fishing reports on Thursday and Friday are going to depend on whether or not I can get Wi-Fi while we're at the lake. 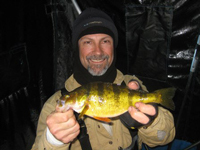 (3/6) On Ball Club Lake, Gus Sheker from Gus' Place Resort; "Fishermen are still doing very well for Perch in shallow water using live minnows during day light hours. Blue Gill & Crappie have been bonus fish for some Perch fishermen. We expect the Perch action to continue to the end of ice fishing season since it has held so very well the past month. 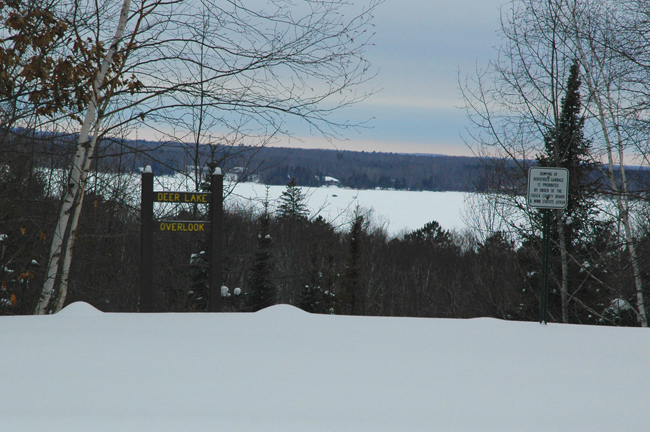 CONDITIONS; The resort maintains plowed access on to trails out on the lake. There is about 8 inches of snow with some deeper drifting. At this time there are no reports of slush, however this will change soon with incoming warmer weather and slush season begins. This year we are 10-12 inches shy of normal ice cap on the lake. We normally have around 32 inches of ice this time of year! As the warm weather finally arrives, the lake will thaw much faster than normal and become unsafe this month. (3/6) On Lake Winnie, John Seekon from The Pines Resort posted; There is 28 inches of ice with 12 inches of snow on top. Off road travel is good in some areas and not so good in others. 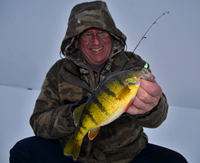 Perch are biting in 12 to 14 feet of water with a minnow a small jig taking most of the fish. When you find an area with active fish, be prepared to drill a few holes to stay on the school of fish. We have lots of roads in tamarack bay, that now have to be accessed through Sunsetview Resort. Wired2Fish (3-6) Shopping for a boat? Are you sure you've thought of everything? Have a look at a pros point of view about the right way to choose your next fishing boat. Click here for How To Choose the Right Fishing Boat. Fishing Report March 6, 2012 - Brian "Bro" Brosdahl; The Perch are starting to school up as they get ready for their spawn. On Lake Winnie, shoreline connected points, rock piles, river channels and weedbeds from 4 to 10 feet of water are producing fish. Deep is a realative term this year, because anything from 10 to 20 is considered deep. In past years 30 to 36 ft was deep. Start shallow and then work your way out. On Winnie, fishermen are doing lots of sorting but that is part of the fun of Perch jerking. Leech Lake is still kicking out fish too, the areas around Goose Island, The Meadows, Hardwood & Deadhead Bay are all producing fish. Use the acess at Pine Point because of massive pressure ridges that seperate most of Sucker Bay. Other productive Perch areas on Leech include; Sand Point and Rice, near Waboose Bay. Tthere is a pay acess on the North end at North Star Resort, which is not exactly a plowed road, but it will get you on tho the North end of the lake. Once you're out there, 12 to 15 feet of water are your best depths. Cass Lake and Pike Bay are both providing fast action, but here again, mostly small Perch. Most of the action is around the town Bay of Cass. North on Pike Bay. 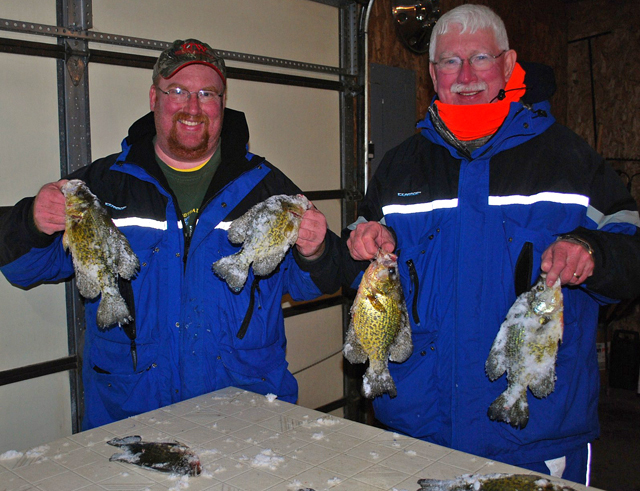 Panfish Crappies are biting well but moving to their late winter areas. 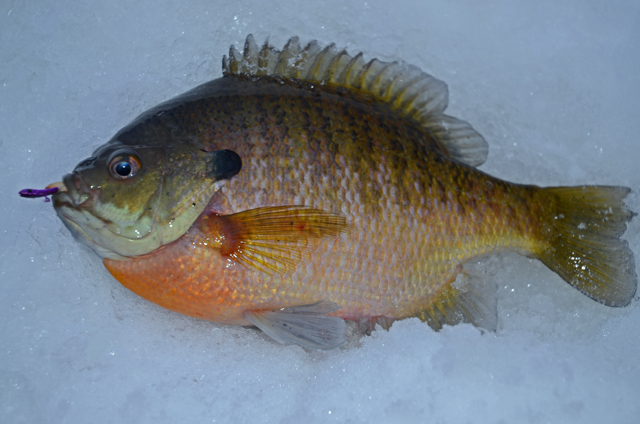 Panfish are also active on a variety of small lakes around the Northern Itasca Area as well. Eel Pout are starting to bite and are located on steep breaks, near deep water, with rocks or Algae covered bottoms. The fresh water Cod type fish get active as they are moving up to spawn. The same areas happen to be producing White Fish and Perch too. Tulibee and White Fish are similar in appearance, but Whitefish have a blunt nose and their upper lip points downward. They are typically larger than Tulibees and they don't smell quite as strong as the Tulibee. Been catching most of my Perch using Lady Bug & Tiger Beetle colored Bro Bugs, tipped with waxies, minows heads or Maggots. Crappies on Slug colored Bro Bugs, the fish are shallow this year. I have been using my Frabill Bro Series 27 in Quick Tip. Because the fish are biting lighter use the wide beam that comes with all Hummimbirds. It is best for shallow watering presentations. (3/6) On Lake of the Woods, Mike Kinsella from Border View Lodge Has this; "Fishing was good during the early part of the week, but slowed after the front moved through. Lots of fish are being marked. Varying presentations seems to help. Jigging spoons or plugs can entice the fish into striking, if they are not feeding. 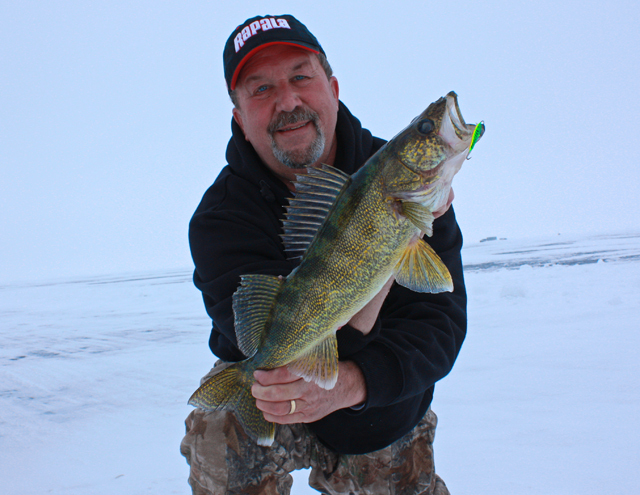 At times, the “dead” stick will work better, for the walleyes looking to get an easy meal." "Northern Pike fishing has picked up in Four-mile bay. A 41 inch pike was brought in this week and several 30+ inchers were released. The next 2 to 3 weeks are prime time for the big pike to stage in the bay. 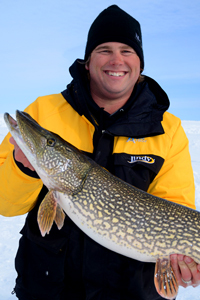 Guided pike trips are available. Give us a call and we’ll literally “hook you up”! It should be a great week of weather, with warmer temps on the way. Hopefully, this will get the walleyes moving and stabilize the bite. Look for us at the Minot, ND show this weekend. Stop in and say “hi” if you are in the area. 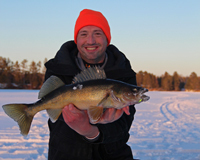 It’s a great time to book a last minute ice fishing trip or your summer vacation! Fishing Report March 5, 2012 Jeff Sundin On Sunday, the weather got a little bit nicer around Deer river. In Bowstring, Minnesota, the sun even figured out how to poke through the clouds for a while. Late afternoon was my first chance to get out on the ice and cover some territory. (3/5) On Bowstring Lake, Erin at Geiger's Trails End Resort; "We have anywhere from 12-18 inches of snow on the lake. Trucks have been passing through ok. Snowmobiles and 4 wheelers are best mode of transportation. We are expecting a warm up this week which means a lot of slush coming soon. Be careful out there." From my Report March 4, 2012; "Hey! For those of you who really know me, you'd already realize that I would bend over backwards to make something special happen for one of my friends. But, there are a few particular friends, for whom I'd do back-flips, somersaults and maybe even go sky-diving without a parachute! My long time customer, friend, advisor and all around great guy, Carl Bergquist is one of them. Carl loves Lutefisk and he loves inviting friends to visit once each year to join in the fun! This year, he decided to start putting together a song about the often misunderstood fish. Someone (a real trouble maker), caught wind of the idea and mentioned to Carl that he needed to get a video for you tube. Whoever this person (the trouble maker) was, also mentioned something about "going viral". Hmmm..., well guess what? That gave Carl a goal, and once he has a goal, he starts looking for a way to make things happen, and the next thing ya' know, right ........ I'm getting involved! Okay, so realizing that it was too late to back out, I enlisted the help another great friend, Don Conroy, who I think would also do just about anything for a friend, especially Carl. Don agreed to pay us a visit so that we could hammer out some kind of a catchy little tune, hopefully. He agreed, and we set up a top secret "rehearsal" somewhere out in the woods, where we did our best to come up with a few ideas. Earlier, I had started going through boxes full of music stuff that I hadn't even seen in five years. I dragged some of it along and we got the ball rolling by coming up with a tune, (sort of) and tweaking a few lyrics. I took it home and tinkered with a few of my old toys and by the time that the 2012 Lutefisk Party arrived, I had a little tape put together. All that remained was to make the surprise announcement to Carl's guests that we had a special treat in store for them. "The Sons (and daughters) Of Torvag" were there to record a live version of the song, ant that they were all going to get their pictures taken! Using a video camera that I borrowed from my pal Jason Green, I and Greg Harms shot a bunch of video during the party, hoping that we'd have enough for Jason to use as he worked his editing magic. Good or bad, we did the editing on Saturday and the video is finished. Now, I need to ask you for a favor; It would really mean a lot to me if you'd click on the link, watch the video and have a few laughs. After that, If ya' like it, then hit your "share" button and pass it along for your friends to see. If ya' hate and think it's disgusting, then hit your "share" button so you can warn all of your friends about the hazards of Lutefisk addition. Finally, if ya' just don't know what to do, then hit your "share" button and lets just see how it works out. Okay then! It's all in good, clean fun and I know that we all loved doing this for Carl, so please help out if you can! Let's just see how many folks we can share this tribute to the jiggly pieces of fish with. Click Here to view "Ya Dont Need No Teet' Ta Eat Lutefisk". Oh, and by the way, THANK YOU! Fishing Report March 3, 2012 Jeff Sundin All quiet on the Northern border! Friday was a recovery day for anglers around the Northland as the temperature crept just above the freezing mark. The snow has already been settling and packing, and in some exposed areas, there may have even been a little melting already. If the sun was ever to make another appearance, we could get one of those high speed meltdowns, followed by another session of "go anywhere you want" style fishing. One word of caution; With the warm temperatures, the packed snow has formed a nice, shiny, slippery surface. The kind that makes your tires spin when you least expect them to. If you plan on heading out accross the lakes in a vehicle, a set of tire chains could be a really great investment. Same thing goes for a shovel and a bag of sand. Since so many Ice-Fishermen were out in force earlier this winter, the recent snowfall seems to have give lots of them an excuse to stay off of the lakes, at least for now. Traffic at the bait shop was slow yesterday afternoon and out on the lake, well, there wasn't anyone within sight. Fishing hasn't changed a lot, but there are some signs of movement. On Bowstring Lake, Perch that were holding in 20 to 26 feet of water have taken up residence in shallower water. 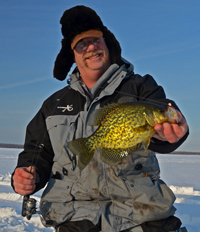 Now, according to Darv Oelke from Bowstring Shores Resort, his customers have found some Jumbos and even some crappies up on the flats in 12 to 16 feet of water. Darv 3 added that on the North end of the lake, vehicles are still travelling fairly easily accross the snow. The landings are not plowed, but there's been enough traffic to keep paths open, at least to the community fishing spots. Fishing Report March 2, 2012 Jeff Sundin In like a Lamb, most definitely! The first day of March slipped into Northern Minnesota quietly, without raising a fuss. Snow from the past few days has already started to pack down and with a little more warm weather, we could shift into late season ice conditions really easily. So far, the recovery process is still going to be a little slower than weekend warriors will want. The rule of thumb for this weekend? Snowmobiles and plowed roads are going to be the key to success. Travel in most un-plowed areas is going to be tricky, maybe even dangerous if you don't already know exactly where you're going. Late in the afternoon, I went out for a short tour to see what kind of shape a few of the landings were in. Right now, they're not particularly good, at the South landing on Bowstring, there was one lone set of tire tracks leading out onto the ice, but no sign of any other traffic. There is no plowed road at that location. There's good news though, along the way, I noticed that almost all of the snow had already melted away from the tree tops and branches. Even many of the roof tops are free of snow as well. If we get a warm weekend, travel by vehicle on many lakes could be restored again by mid-week. Plowed Accesses that I know you can depend on for this weekend; On Lake Winnie, The Pines Resort in Tamarack Bay, Highbanks Resort on the East shoreline, Denny's Resort - Ryan Peterson on the South end, McArdles Resort (road from public access on West side), Third River Landing (Dixon Lake Resort) Nortwest Corner of the lake. On Leech Lake; Pine Point. On Cass Lake; So far, I only know about the private roads that Wishbone Resort and Chad Benson have plowed for use by their rental customers. I will be working on an update for Cass this morning. Fishing Report March 1, 2012 Jeff Sundin Oh Oh! Looky here, there's something a lot less wintery sounding about the date today. March! Our gateway to spring! I'm not sure how to count what happened around here yesterday, should we consider that it was March rolling in like a Lion? or Just think of it as an extra day that we can forget about? I do know one thing, March promises to be a great month! A couple of trips up to Lake of the Woods, a few seminars, a couple of boat shows and of course, longer, brighter, warmer days ahead! On Wednesday, the high winds kept a lot of us inside, watching the snow blow sideways isn't exactly the recipe for getting a lot of great fishing news, but there were a few die-hards out there. Right now, Perch fishing is getting most of the attention because it's a little easier during windy weather. There's almost certain to be significant drifting of snow on the lakes now. In some areas, travel is probably going to get tricky. The wind blew hard from the Northeast on Wednesday, so for me, I'd be looking to use landings on the North side of most lakes today. Using plowed roads will cost a few bucks, but are going to be worth the trouble. Lake Winnie continues to kick out good numbers of Perch, but sorting through them to get a batch of keepers has been the rule of thumb. There are fish in the weeds, up as shallow as 5 feet and there are still a lot of fish on the deeper flats, roaming in 14 to 18 feet. Kim Leonardt at Highbanks Resort says; "Off road travel is becoming more difficult. We had gusty winds here today (Wednesday) making plowing difficult. Our trucks will be back out tomorrow re-opening roads." Leech Lake is producing too, although there's not a lot of news coming from over there, the anglers who do let a few words slip, are telling me that the West side has been producing reliably. One problem with Leech this winter has been the pressure ridges that cropped up early. They've forced anglers into choosing a small section of lake and then staying there. Now that we have snow, using the landing at Pine Point is the best idea. The areas around Goose Island, The Meadows, First and Second Duck are producing fish. In Portage Bay, The weeds near Waboose Bay, Grassy Point and on the drop off West of Federal Dam are producing fish too. Smaller lakes like Round, Bowstring and Sand are also producing fish, but plowed roads might be a little harder to come by on these lakes. Musky Fishermen; The Star of the North Chapter of Muskies Inc. has two events coming up this month. On March 15, 2012 at 6PM, they'll be holding a Musky lure demo at the Grand rapids middle school pool. (3-1) Bemidji Lakes Area and NMLOG Member, Paul A. Nelson, Bemidji Area Lakes Guide Service says; Heavy snow hit most of Minnesota this week, with the lakes now covered with enough snow to inhibit travel on the lakes. Anglers with fish houses on the ice in the Bemidji area still have some time to get their houses off the lakes, but sooner would be better than later for most anglers considering the amount of snow on the lakes. The gamefish season is closed, so anglers will be pursuing crappies, sunfish, perch, tulibees, whitefish and eelpout for the rest of the ice fishing season on the inland lakes of Minnesota. Anglers also have the option of heading north to the border lakes with Canada, where Lake of the Woods, Rainy River and Rainy Lake are some of the destination lakes for extended seasons on walleyes, sauger and northern pike. Bemidji angler Aaron Guthrie set the Minnesota state record for eelpout on Lake of the Woods this past week with a 19.54 pound monster fish. The new record eelpout was just under a ¼ pound larger than the previous record eelpout, which was also caught on Lake of the Woods. The snow cover on the lakes is a set back for fishing and will likely slow down angling for most species until warmer weather returns. The excellent March fishing usually begins when the snow begins to melt and fresh water starts to run into the lakes. The additional sunlight in the shallows also helps bring the shallows back to life and encourages fish to move back into the shallows to feed. 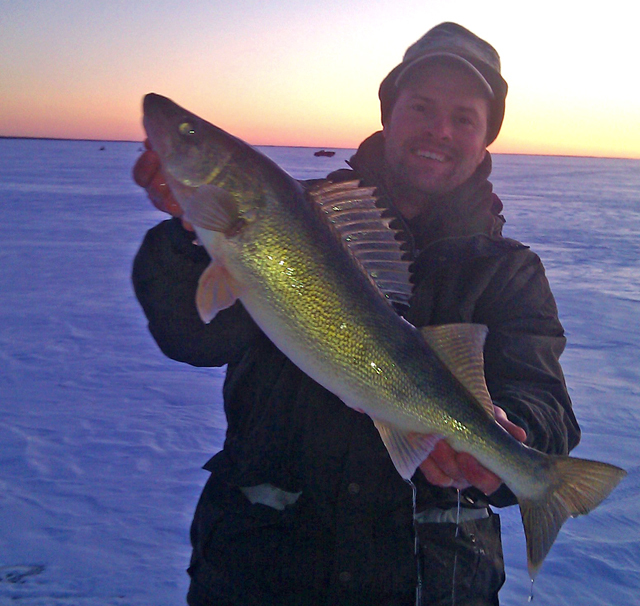 (3-1) From Lake of the Woods, Jacki LaValla from Sportsmen's Lodges reports "Fishing has been a little spotty this week. Lots of fish around but they seem to be playing hard to get. Best advice? Pack an arsenal of different tackle options, electronics and a try a few different techniques. We ae moving into March which is typically a great "catching" month." We can have our houses out until March 31. - Check out our 100% Ice Guarantee! (3-1) From Lake of the Woods, A press release from Lake of the Woods Tourism reads; "Beauty is in the eye of the beholder.- Potential State Record Burbot Caught on Lake of the Woods".
" Burbot, also often reffered to as eelpout, are not a very respected fish and are often times coined as an ‘ugly’ fish, the “ish” of fish. Some people do not dare to touch the slimy fish because of its tendency to try to wrap around an object as a snake would. Not an avid fisherman like Aaron Guthrie of Bemidji, though. Aaron often travels to Lake of the Woods targeting the burbot he loved to eat. Aaron Guthrie spent the day fishing Lake of the Woods near long point for his share of walleye and sauger with family members. As evening approached they switched gears, adding minnows to their lures to target some ‘pout’. 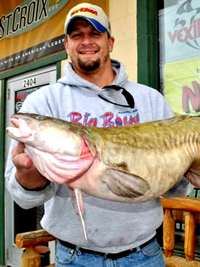 Guthrie was fishing 34 feet of water when he landed a monstrous burbott. ”It’s a once-in-a-lifetime ‘pout” Guthrie had to say about the 19.54 lb trophy. Clearly finding his catch a thing of beauty. Dennis Topp, assistant area fisheries supervisor in Lake of the Woods County, was the DNR officer to watch the trophy hit the scale and help Guthrie begin the certification process. “It’s kind of a big deal!” Topp said with enthusiasm. He had also certified the previous state record eelpout that measured in at 19lbs 3oz and was also caught on Lake of the Woods". (March 2012) Smiles are always welcome! Last month I used an Abacus to count them! Don't forget, if you want to add your 2 cents worth, or to ask a question about this, or other reports, click here to Join Me On Facebook. Jeff Sundin is a full time, professional fishing guide, outdoor writer and photographer. Jeff is available for fishing seminars, fishing promotions and media events. Click here to read more fishing articles and fishing reports. Conditions at landing sites are going to deteriorate fast over the next few days. Snow cover is almost entirely gone and standing water is common on all Deer River area lakes. Finally! The long awaited 2012 Lutefisk Song, Ya' Don't Need No Teet' Ta' Eat Lutefisk. Go ahead, try and watch this one without smiling. The promise of a 20 pound Pike makes it worth putting up with a little crummy weather! You don't have to catch many of these to have a good time. Neil and Shannon found a little honey hole for Crappies. 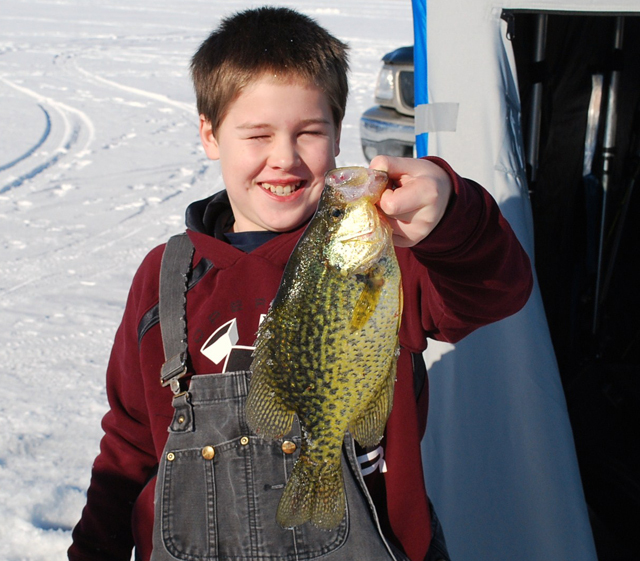 So at the moment, they have the lead in the Trails End Ice Fishing Contest for March with a 12-1/4 inch Crappie. Want some? Just Click Here, I Dare Ya! Courtesy Gus' Placxe Resort; Perch fishing on Ball Club Lake remains good in shallow water. At the landings, snow is manageable, but prepare for drifting and slush. Tire chains? Could be a good investment. Congratulations Walt! 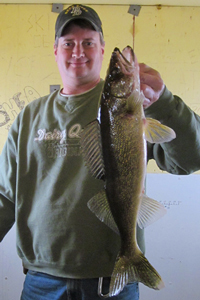 His 21 inch Walleye was the winning fish in Geigers Trails End Fishing Contest for February. Wayne Crandall and Jeremy Olson didn't give up. They decided to brave the elements and worked hard, but eventually found some really nice Crappies. 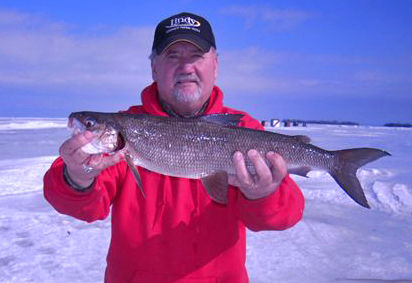 Mike Rosner has been fishing Green Bay for Whitefish lately and the fish are cooperating. A Lindy frostee or Rattlin Flyer in about 30 feet of water will do the trick. Nashwauk-Keewatin school district‘s “No Child Left Inside” program was held last Friday. Click Image To See Report. Crappie fishing in the Deer river area continues to be good. For me, 22 to 26 feet of water has produced consistent results. Bloodworms are hard for a Perch to turn down. When you see this, start looking for Jumbos in deeper water over a Marl-Clay bottom. In-Fisherman's Chuck Beasley enjoys a moment on the down-range side of the camera. Marty Glorvigen, Wired2Fish lets us peek during the filming of vido segments. Not bad! Pro Guide and Writer for Outdoor News, Steve Carney shows off the results of teasing 'em on to the hook. Sometimes ya just gotta make 'em bite! What had been a great Crappie hole, was transformed over night. Now the Perch had moved in to feed on insects. 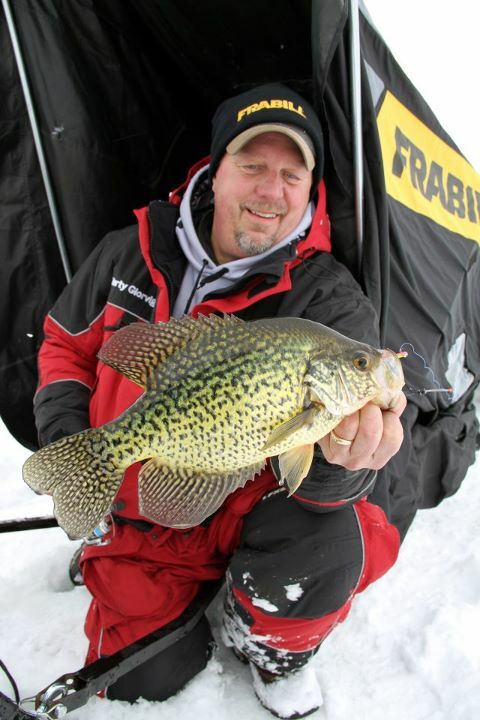 Deer River area Crappie fishing has been good for Bill Powell of Freds Bait. Perch were nomadic, chasing schools of minnows in 6 feet of water. When we found them, they'd bite. We found some Crappies in a small, 21 foot hole located on top of a large mid-depth flat. They were finicky, but for Arne Danielson, they were coaxable. Perch managed to shrug off the weather change and kept on eating. It was a good day to be Arne Danielson! Photo Courtesy: John Henneman, Wisconsin Rapids, WI His 29-1/2 inch Walleye was caught and released on Lake Winnibigoshish! Way To Go! Courtesy Matt Breuer, North Country guide Service. 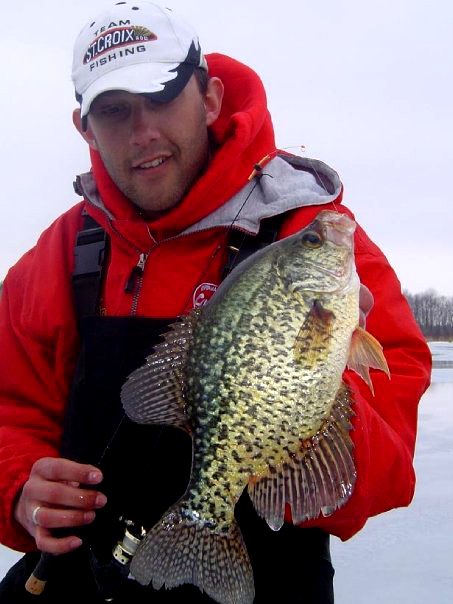 Concentrate on the deep edges of the breaks iinto main lake basins for Crappie. With great travel conditions, fishermen seem to be everywhere. Usually quiet, Pokegama Lake is bustling with activity right now. 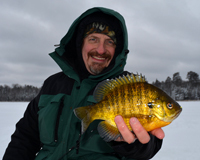 Shallow water Bluegills are common during the later part of the ice season. This year, they've been shallow all season. Light snow cover has allowed good light penetration and weeds, like this piece of Cabbage are still green. 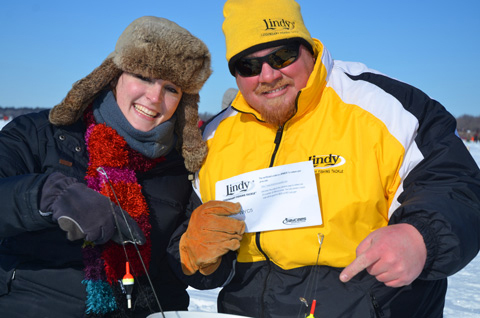 We caught anglers wearing Lindy gear or fishing with Lindy Fishing Tackle and rewarded them with certificates for prizes from Lindy. 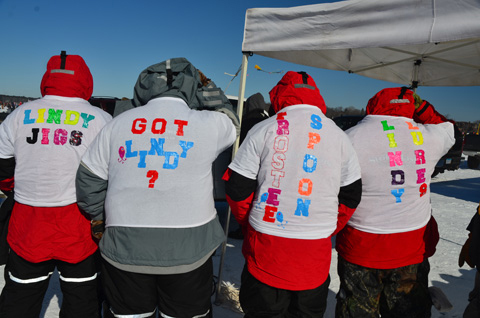 Anglers looking for a little attention on the ice, figured out that a little creative flair never hurts either. Crappie location trending deeper. In 24 to 30 feet of water and suspended a foot or two from the bottom. This one got fooled by a Red Frostee Spoon. Lake of the Woods kicks out some dandy Perch! Pro Guide Tom Neustrom shows off a super-magnum. Red Lake Walleyes with Jonny Petrowske and Jeff Sundin. Crappies have moved deeper. The good news, now they're more concentrated too! This one was in 24 feet of water and struck a Rattln' Flyer Spoon. Fishing from 9am to 3pm, the pair of ice fishermen iced 6 or 7 including a beautiful 6 pounder that Brian caught. On Lake of the Woods, some of the action has moved to 33-34 feet, about 12-14 miles off-shore into Traverse Bay and there is plenty of ice. Maybe the bright sunshine, maybe the warm weather, or maybe even the full moon. But there were clear signs of a movement toward new areas over the weekend. Courtesy: Gieger's Trails End Resort. Crappie action has been picking up on Bowstring Lake. Courtesy: Matt Mattson, Jack Swanson shows off his afternoon highlight. A 6 pound plus Walleye that raced in and slammed his bait six feet above the bottom. I worked hard to pull a few fish out of this school located in 28 feet of water. Even though they weren't too cooperative, it was enough to keep me searching.